KUALA LUMPUR (Aug 3): CIMB Investment Bank Bhd raised its target price for KLCC Property Holdings Bhd shares to RM7.35 from RM7.05 after taking into account the recent cut in Bank Negara Malaysia's overnight policy rate (OPR) from 3.25% to 3%. In a note today, CIMB analyst Kristine Wong said CIMB reduced its risk-free rate assumption to 3.6% from 4% after the OPR cut. Wong said CIMB maintained its "hold" call on KLCC Property shares. "We (however) cut our FY16–18 EPS estimates by 1.1–4.7% to account for higher operating expenses," she said. CIMB's note followed the announcement on KLCC Property's second quarter results yesterday. KLCC Property said net profit fell to RM177.86 million in the second quarter ended June 30, 2016 (2QFY16) from RM179.86 million a year earlier. For the six-month period (1HFY16), net profit rose to RM360.62 million from RM358.37 million. Today, Wong said KLCC Property's 1HFY16 core net profit was below CIMB's and consensus forecast. "Overall, KLCCP Stapled Group's 1HFY16 core net profit of RM360.6 million was slightly below our and the market's expectations, accounting for 47% and 48% of the respective full-year forecasts," she said. 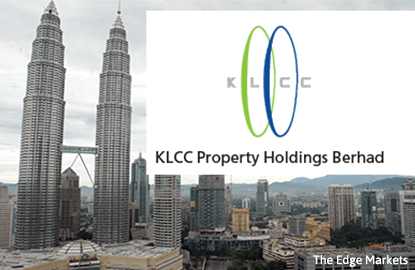 In 2013, KLCC Property shares were stapled with KLCC Real Estate Investment Trust units to form KLCCP Stapled Group. At 12:30pm, KLCC Property shares settled unchanged at RM7.50 for a market value of RM13.56 billion. The stock saw 240,500 shares traded.